Announced at Apple's press conference today, this is the iPhone 5, out September 21. Although Apple didn't spend a lot of time talking about gaming today, they did bring out Rob Murray, CEO of EA studio Firemint, to show off a new game called Real Racing 3. 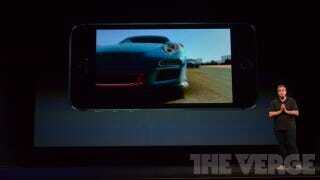 "We created the ultimate racing experience on iOS," he said, as transcribed by The Verge. "Today I'm going to show you the next level. Real Racing 3... Real tracks, real cars, real people you can play against anytime you like. "Now you can see Vince is driving, and he's racing me. How is that possible? Well we're using a feature in Game Center. Time shifted head to head." "Full console quality," he said. This story has been edited for clarity following the Apple conference.